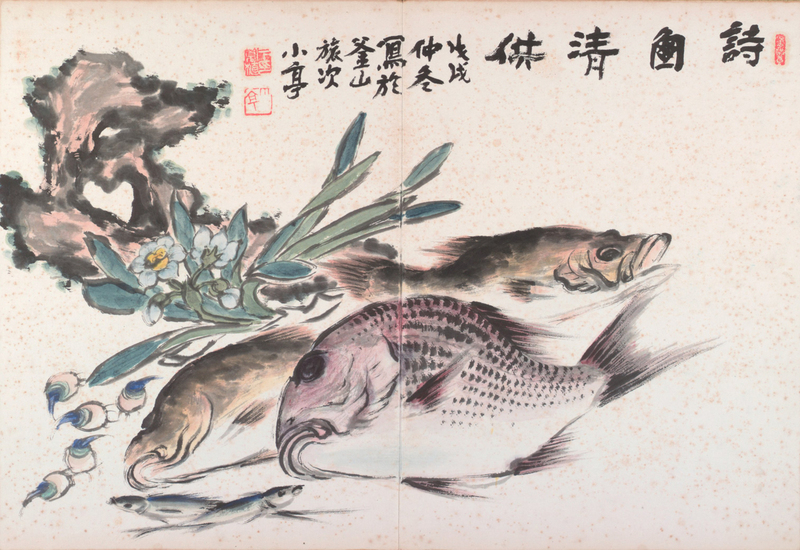 Painted in a loose brush style associated with scholar-amateur painting, this image of fish, a scholar’s rock, and narcissus conveys auspicious wishes for prosperity and the coming of spring. Known especially for his landscape paintings, Byeon Gwan-sik is admired as one of the great masters of twentieth-century painting in Korea. A pupil of the last Joseon court painter Jo Seok-jin (1853–1920), he also studied with An Jung-sik (1861–1919), and advanced traditional ink painting into the modern era. This page comes from an album of paintings by the leading artists of traditional ink painting in the 1950s and ’60s. The collaborative work was made expressly for their friend and colleague, Young Joon Joh (1911–1981), a banker who excelled in a range of arts, including painting and calligraphy, as well as violin, Korean flute, and Korean drum performance. The tradition of artists getting together to write, paint, and share their artistic vision has a long history in East Asia. Among the twenty-three paintings in this album are works by Heo Baek-ryon (1891–1977); Gim Eu-ho (1892–1979); Byeon Gwan-sik (1899–1976); Yi Sang-boem (1899–1977), Young Joon Joh (1911–1981); Kim Ki-chang (1914–2001); Gim Jeong-gyon (1915–1976); Chang U-song (born 1919); and Chun Kyung-ja (born 1924).